Proud recipient of the Niagara on the Lake Celebration of Heritage award for preservation of a historical property. This is a pristine two-bedroom Canadian Victorian farmhouse built in 1850 by the family of Jeremiah Hoyt, a run-away Quaker slave who arrived in Niagara-on-the-Lake via the underground railroad. 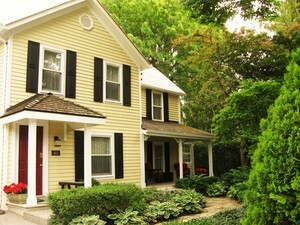 The house is located on a half-acre property six blocks from Queen Street and theaters. Piano House offers a serene, private retreat with antiques, hardwood floors, lace curtains and central air conditioning throughout. You'll be restored by its calm and restful interior, beautiful gardens and three separate outdoor sitting areas. This gracious home is adult-oriented. There are two bedrooms and a bath on the second floor, one offers a queen four-poster bed, the other has an antique European double bed. First floor has formal 'parlor' with spectacular carved mahogany piano and Victorian sofa, formal DR, den/TV room, powder room and new fully equipped kitchen with dishwasher and microwave. Linens and towels are provided. No smoking and no pets, please. Weekly discounted rates are available.